Ordinary number signatures Sriwisarn-Serm EF about 4,400 - 4,600 baht. Ordinary number signatures Wijit-Serm VF about 2,600 - 2,700 baht. 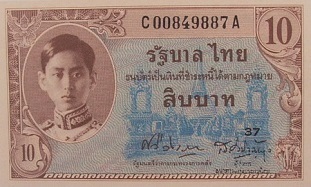 The 8th series 10 baht banknotes were printed from USA after the end of world war 2. The paper used was that used for banknotes that were used by the US army as currency in the areas under their control in Europe at the end of the war. The paper had a watermark "MILITARY AUTHORITY". After supplies of this watermarked paper were exhausted, plain paper were used. To make it easy to verify and prevent forgery, Arabic numerals from 1-70 were printed in black ink at the lower right corner on the front. 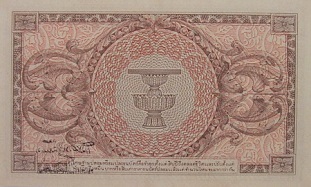 The 8th series 10 baht banknotes were announced on 27th November 1946. The main object is the image of King Rama 8 on the left. The middle image is Phra Patomjedi. The serial code and number were the same as American banknotes that is an alphabetical letter before and after an 8-digit number. The main object is the constitution on the pedestal tray.